Fix "iTunes Asks for iPhone Backup Password that I Never Set"
"Enter the iTunes backup password" can be a really annoying issue as it prevents you to access your encrypted backups. Sometimes iTunes prompts this message even if you haven't set any password, which makes this issue very annoying. Fortunately, there are several ways to deal with this problem. Read on to find how to decrypt iPhone backup password if you never set. Why Does iTunes Ask for a Password to Unlock iPhone Backup? iTunes only asks for a password upon accessing the backup when the backup is encrypted. 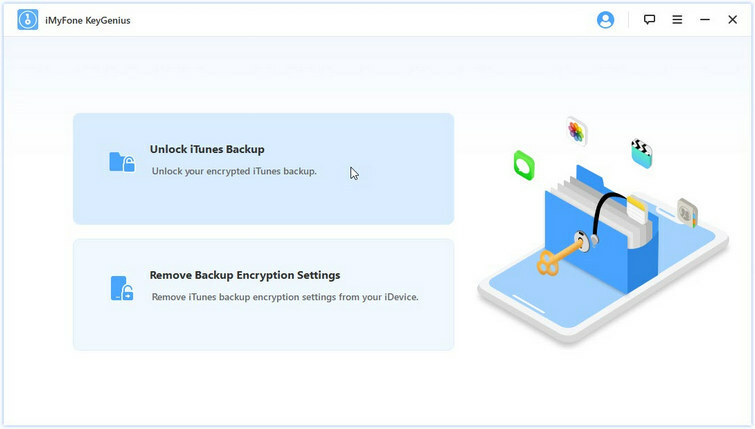 You can create encrypted iTunes backups by enabling the Encrypt backup option. The password you set at that time is the same password that you will need to provide in order to unlock the encrypted backup. iTunes Asks iPhone Backup Password that You Never Set? Fix It Now! If you don't remember setting any password when encrypting your iTunes backups, then it would be a good idea to use a third-party tool to recover the password so you can unlock your encrypted iTunes backup. iMyFone KeyGenius is a recommended tool that can help you in this regard. 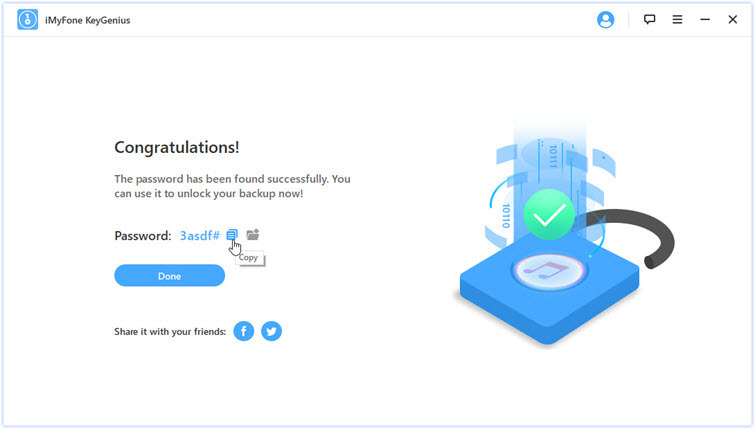 This tool has several attack methods to decode iTunes backup password and it's easy to use process allows you to find the password in an efficient way. iTunes asks the iPhone backup password you never set? Solve this with KeyGenius in three ways! Very high iTunes backup password unlocking success rate. User-friendly software interface. 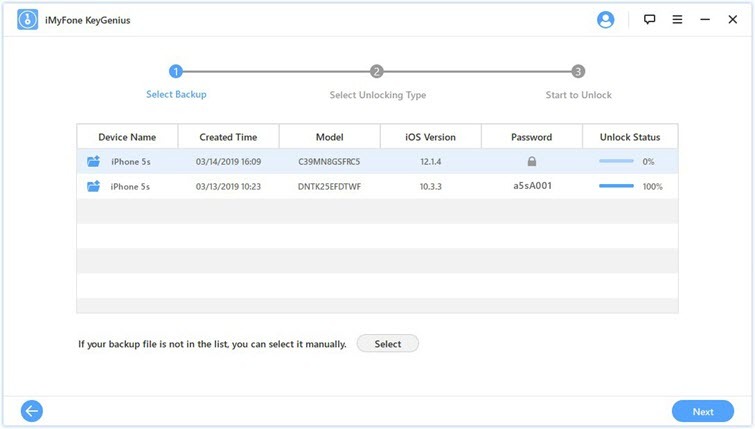 Decoding and finding iPhone backup password is a 3-step process in KeyGenius. 100% safe to use. KeyGenius does not corrupt or damage iTunes backups during the decoding process. You can pause the decoding process and resume it at a later time for convenience. Step 1. Launch KeyGenius on your computer. Then select Unlock iTunes Backup on the home interface of the software. Step 2. 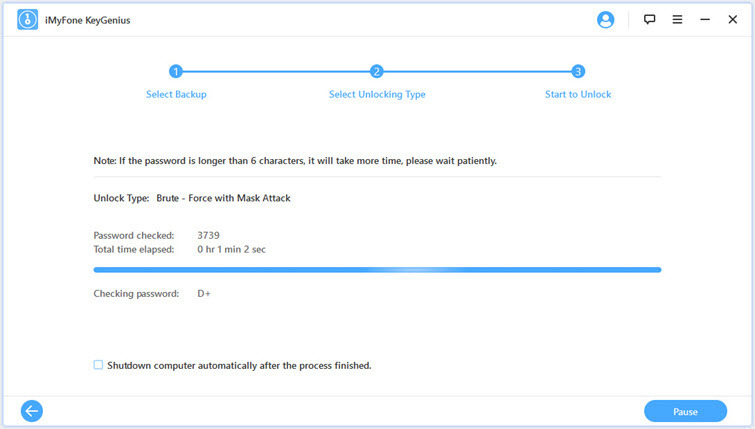 On the next screen, select the backup of your choice and then click on the Next button. Step 3. Now select an unlocking method. 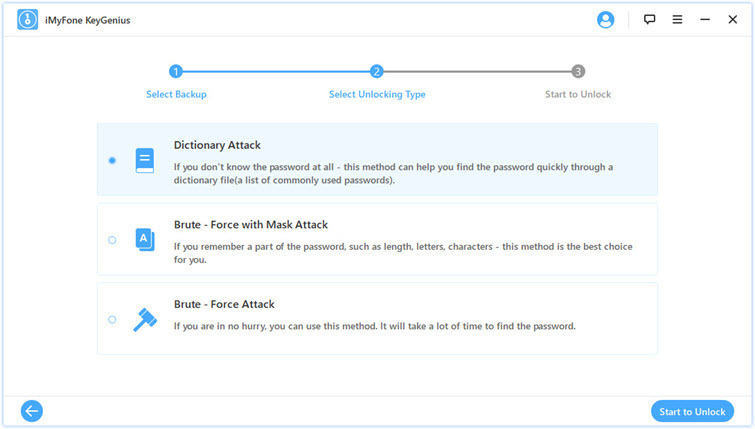 You can choose from Dictionary Attack, Brute - Force with Mask Attack, and Brute - Force Attack. After selecting the desired method, click on Start to Unlock button to start the decoding process. Once the decoding process is complete and the software has found the password, it will display the password on the next screen. Navigate to iCloud and log-in using your Apple ID. 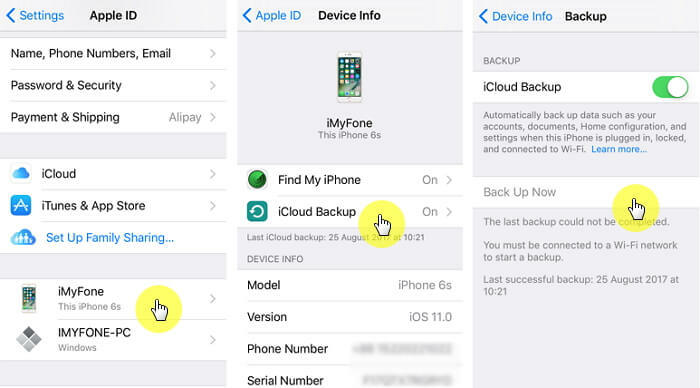 Now find the Backup option in the iCloud section and turn on "iCloud Backup". After that, tap the Back Up Now option to immediately start creating a backup of your device via iCloud. If you cannot backup your iPhone media files via iTunes as well as iCloud, then an alternative is to use third-party iPhone data backup tool. iMyFone TunesMate is a one of the best tools in this regard. It is a powerful iPhone media manager that allows you to back up your iPhone media to your computer with ease. Backup any or all iPhone media files to your computer quickly and conveniently. Rebuild damaged/corrupted iTunes library from your iPhone or iPad. Two-way transfer: transfer files from iPhone to iTunes/computer and vice versa. 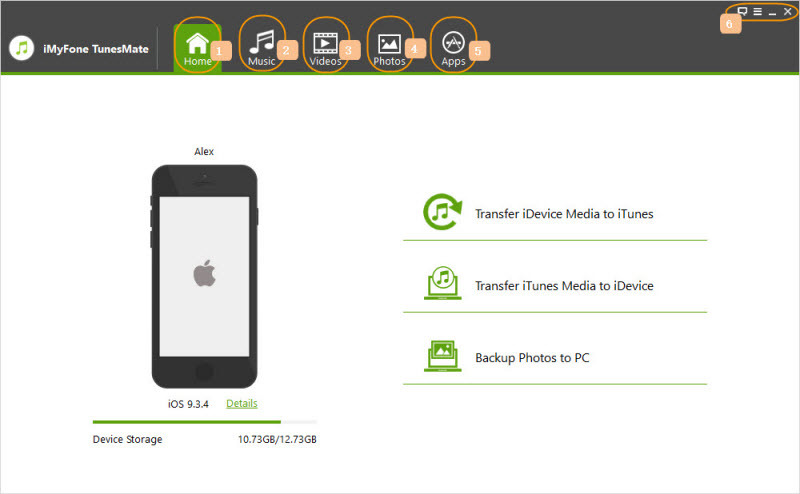 Very fast data transfer speeds, allowing you to backup/restore your favorite iPhone data quickly. Compatible with all latest iDevice models and iOS versions. Step 1. Download, install, and launch iMyFone TunesMate on your PC. Then connect your iPhone to your computer via a USB cable. TunesMate will automatically detect the device. Step 2. Now click on one of the media tabs to browse the media files on your iPhone. For example, click on Music to browse all the music stored on your iPhone. Step 3. 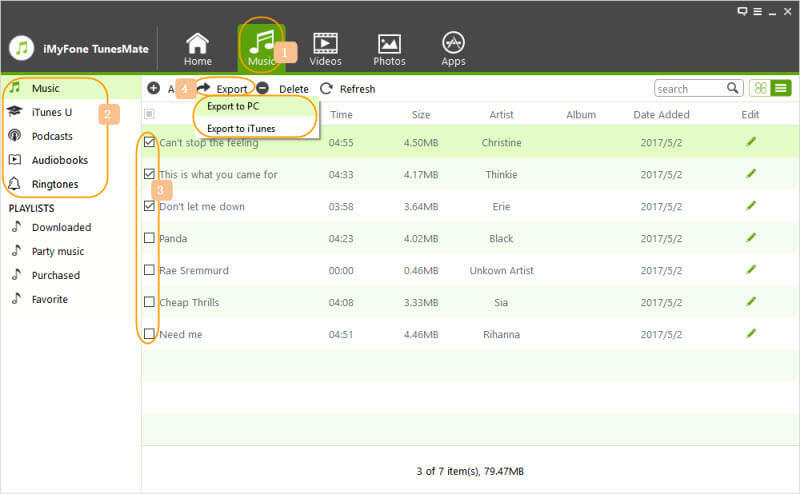 On the next screen, select the files that you want to back up/transfer to PC and then click on Export > Export to PC. Step 4. 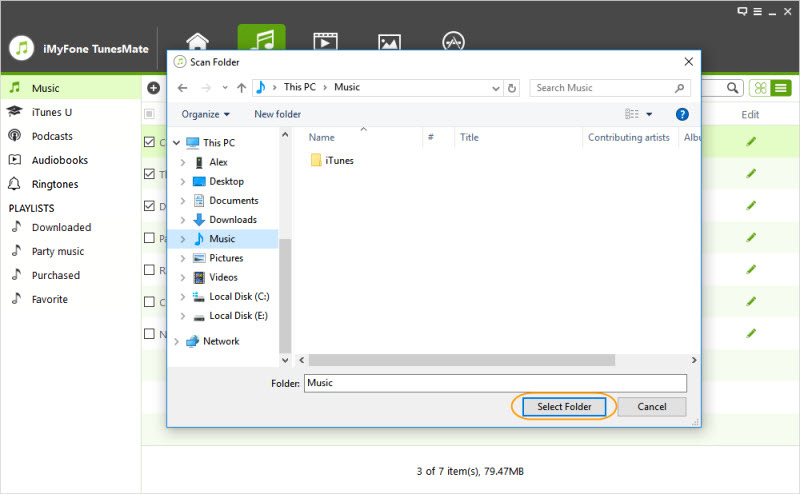 Navigate to the folder on your computer where you want to transfer the selected files and then click on Select Folder. The data transfer process will begin.